Xiaomi has made its first concrete move towards updating to Android 7.0 Nougat on its devices. The news has given a big surprise to a good part of the owners of a smartphone of the Chinese brand. The update to Android Nougat (for now in the form of Global Beta ROM) will begin to occur in the Xiaomi Mi 5, Mi Max, Redmi 3S and Redmi 3S Prime as of today, November 30, and any user possessing one of these smartphones can try this new firmware version (MIUI 8.0 based on Android 7.0 Nougat) by sending a request to participate now. 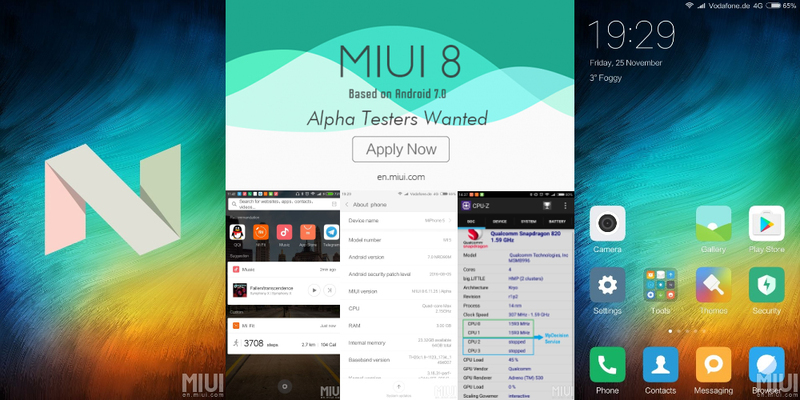 This is of course an official alpha beta, as on other occasions, and may lead to certain instabilities (known by many after the last non-stable update of MIUI). The owners of one or more Xiaomi smartphones may request their participation in the program through a special request form on the manufacturer's website. Once your data is corroborated, and if all goes well, you will be contacted to start the alpha beta phase with the new firmware. It is obvious that, in reality, not all those who give their consent to the tests, will be chosen by the manufacturer, but not due to a kind of strict selection, since it is not clear what criteria the company will use for the development of the latest version of Google's operating system. Apart from the limitations that the beta phase implies, as it will only be available on the above mentioned devices (Xiaomi Mi 5, Mi Max, Redmi 3S and Redmi 3S Prime), another limitation for testing Android 7.0 is based on time. In practice, only applications received today, November 30, will be accepted, while any request that arrives later will not find a positive or satisfactory response.